Hippopotamuses are large mammals, with short, stumpy legs, and barrel-shaped bodies. They have large heads, with broad mouths, and nostrils placed at the top of their snouts. Like pigs, they have four toes, but unlike pigs, all of the toes are used in walking. Hippopotamids are unguligrade, although, unlike most other such animals, they have no hooves, instead using a pad of tough connective tissue on each foot. Their stomachs have three chambers, but they are not true ruminants. The living species are smooth-skinned and lack both sebaceous glands and sweat glands. The outer epidermis is relatively thin, so hippos dehydrate rapidly in dry environments. The hippopotamids are descended from the anthracotheres, a family of semiaquatic and terrestrial artiodactyls that appeared in the late Eocene, and are thought to have resembled small- or narrow-headed hippos. The hippos split off from the anthracotheres some time during the Miocene. After the appearance of the hippopotamids, the remaining anthracotheres went into a decline brought about by a combination of climatic change and competition with their descendants, until the last genus, Merycopotamus, died out in the early Pliocene of India. There were once many species of hippopotamid, but only two survive today: Hippopotamus amphibius, and Choeropsis liberiensis. They are the last survivors of two major evolutionary lineages, the hippos proper and the pygmy hippos, respectively; these lineages could arguably be considered subfamilies, but their relationship to each other - apart from being fairly distant relatives - is not well resolved. The enigmatic Miocene Kenyapotamus is insufficiently known to be assigned a place in the hippo phylogeny with any degree of certainty. In addition, the genus Hexaprotodon, in a sense now restricted to an extinct group of animals once living around the northern and northeastern Indian Ocean, which formerly included most ancient hippos, has turned out to be paraphyletic. The lower canine teeth of hippopotamids are similar in function and structure to the tusks of elephants. While hippopotamids and elephants are only very distantly related within the Mammalia, the lower canine teeth of both groups are long and have a slight curve, and species of both families use this structure when fighting. The systematics and taxonomy used here mostly follows the review of Boisserie (2005). ^ Laws, Richard (1984). Macdonald, D. (ed.). The Encyclopedia of Mammals. New York: Facts on File. pp. 506–511. ISBN 0-87196-871-1. 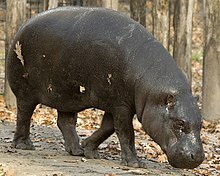 ^ Boisserie identified the species Hippopotamus minor as Phanourios minutus, but this genus is not widely recognized. "Hippopotamidae". Integrated Taxonomic Information System. Retrieved 11 August 2004.